Is my work chair causing my back pain? Is my work chair the real cause of my back pain? Lower back pain is now the leading cause of disability and work absence throughout much of the world, and is increasing. But our early ancestors must have evolved healthy backs simply to survive, so most of us have probably inherited healthy backs. This suggests that something about our modern lifestyle may be responsible for this epidemic. Some research shows that sitting with a bad posture may be largely to blame. Most of us distort our spines when sitting 'upright'. If you do this regularly it weakens your spine. It is then easily injured when lifting, twisting etc. You may not feel any pain while sitting but it is still likely to be the underlying cause. Have you noticed that most people sit ‘upright’ like in Fig.1? The chair has tipped the pelvis backwards off balance. As the torso weight bears down on the spine and the seat pushes the base of the pelvis up, the pelvis becomes a lever bending the spine forwards and distorting it. (There are ligaments to limit this bending. They are strong for brief exertions like lifting, but under prolonged stress they stretch till they can't protect the discs.) The results are strained ligaments and compressed intervertebral discs. The best way to treat most back pain is to improve the way you sit, but if it doesn't improve within a few weeks you should see your doctor as the causel could be a medical one. "Mechanical back pain" Sudden acute pain usually brought on by bending, lifting, or twisting. Doctors often can't find a cause. John Gorman (see below) believes this has evolved as a warning to stop activity that is putting discs at risk. Prolapsed or herniated (slipped) discs, and possibly sciatica, could happen at anytime when bending or lifting. If we introduce a lumbar support, like most 'ergonomic' chairs do, it will push the spine into an apparently healthy shape. 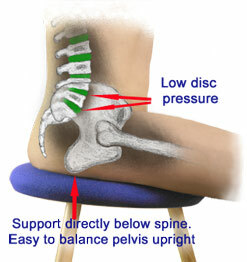 The theory of lumbar support is a simple but widespread mechanical error. But I feel better with lumbar support! When your back has been strained, muscles around the injury often tense to protect it. They are lifting muscles, evolved for intermittent use, and will ache if under continuous tension. (This tension and dull ache can become chronic. Stress may trigger it regularly, sometimes long after the original disc or ligament injury has healed.) We think lumbar support feels good because it gives relief to these overworked muscles, even though it is partly to blame for the original injury. It is far better to stop causing the distortion, so the muscles can learn to relax. Most of this information comes from John Gorman. He is possibly the first person to analyse the mechanics of the spine as a trained engineer, rather than from a medical perspective (although he is also a chiropractor). His very convincing conclusion is that much back pain is a result of mechanical damage to otherwise healthy backs, and is not a medical problem at all. The solution lies in changing the way we sit. The medical profession is conservative and hasn't taken up these ideas yet, but it doesn't seem to have an alternative explanation. 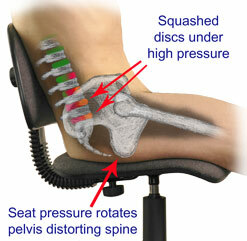 A near doubling of disc pressure from standing to sitting has been measured and is widely quoted. This is accepted without question, with little attempt to understand why the pressure should rise at all. John Gorman explains why - and how to avoid it. I (Andrew Webb) have been using John Gorman's ideas together with Alexander Technique since 1988, they do work and have cured my back pain. I am convinced he is right. Our backs are perfectly evolved for a hunter gatherer lifestyle, which was much more strenuous than ours (and did not include chairs!) Any early human crippled by back pain would be unlikely to survive (let alone feed children) long enough to have descendants, so evolution ruthlessly eliminated all but the healthiest. It is always worth looking after your back. Whether completely healthy or with severe osteo arthritis, it is never too early or too late to protect yourself from further damage, and help your back heal as much as possible. As you can see the coccyx is not touching the seat in Fig. 2. Just changing to a forward sloping seat will probably ease the pain, but with posChair we can make a cutout in the foam padding too - just ask us.